AN ELDERLY WOMAN has died after a collision involving at least six cars. This happened on the M1 motorway yesterday close to the Cornakinnegar Bridge between Moira in Co Down and Lurgan in Co Armagh. Following the incident the road was closed in both directions, creating long tailbacks. The closure continued into last night and diversions were in place. 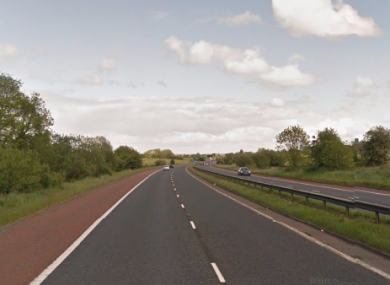 ANTRIM: M1 remains closed both ways between J9 Moira & J10 Lurgan as emergency services deal with a collision. Diversions in place. A second collision followed this first incident, and happened around one mile away on the same stretch of road. The woman killed was seated in the rear of one of the vehicles involved in the crash. The BBC has reported that a number of other people sustained minor injuries in the incident. Email “Elderly woman dies after six car motorway collision ”. Feedback on “Elderly woman dies after six car motorway collision ”.